CHICAGO, June 15, 2015 – Steelcase today demonstrates new concept products for the Intelligent Office, a future workplace which integrates technology into places that can enhance human interactions at work and give workers more control over key sources of distractions that impact performance such as noise, interruptions, lighting and temperature control. These concepts represent Steelcase’s explorations of how work environments in the future might better address a range of distractions and obstacles at work that leave people feeling overwhelmed and less productive. 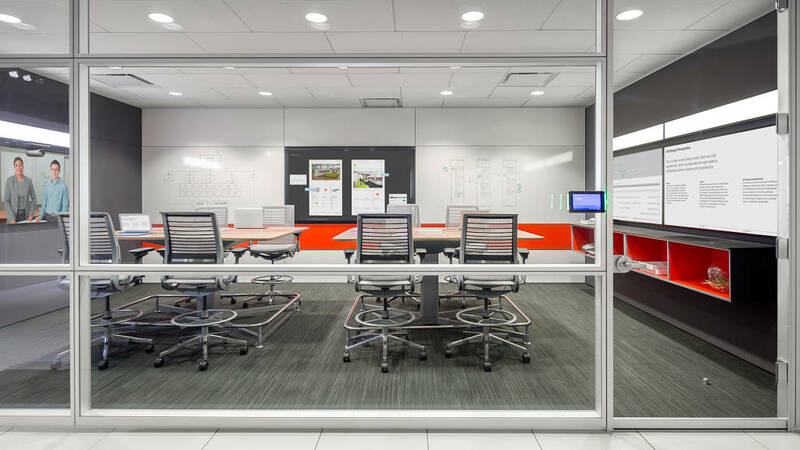 The Intelligent Office concept from Steelcase integrates sensing devices into the work environment that gather and aggregate data and learn over time what people want and need. The company is displaying its vision for embedded technologies that help mitigate distractions and augment interactions at work at NeoCon 2015 in Chicago. Neuroscience reveals that focus is a limited resource, and like the rest of the human body, brains get tired. Activities such as analyzing, prioritizing, planning and critical thinking are energy guzzlers. To protect our energy, our brains work in cycles of peak activity and downtime. The Steelcase meta-analysis of neuroscience studies found that to increase productivity or creativity, workers should not attempt to focus longer or put in more hours, but rather learn to better manage the rhythms of attention throughout the day. The workplace can be designed to mitigate distractions and shape the behaviors of workers by offering choices that increase control of the stimuli around them. “When workplaces are designed as an ecosystem of differentiated zones and settings, workers can appropriately select spaces that match their brain modes and activities as they move through their day. This understanding of neuroscience helps us integrate technology into the workplace in a way that helps people cognitively offload information into the physical environment and help them feel less overwhelmed,” continued Smith. Brody™ WorkLounge with sensors: A concept sensor in the new Brody WorkLounge seat activates a red light around the perimeter of Brody, signaling to others that the unit is occupied. A simple audio control appears on the side surface, allowing people to choose from a selection of sounds playing from speakers embedded in the headrest. A heated lumbar option keeps workers comfortable, addressing one of the top distractions in the workplace – being too cold. Intelligent Divisio™ Screen: The concept Divisio screen, which divides individual workspaces, signals if the space is available or occupied. It also displays time, date and temperature information. The screen features a ‘do not disturb’ button so workers can signal their need for uninterrupted time. The device also provides workers with additional notifications to support supporting their wellbeing, such as notifications to periodically stand up and move, reminders to take a break and alerts for upcoming meetings. Gesture® chair with integrated, intelligent technology: Concept sensors in the Gesture seat monitors workers posture, sitting habits, stress level and even coaches workers to sit better. As workers sit in Gesture, this data will be displayed on a nearby iPad®. This technology is provided in collaboration with Darma. media:scape® TeamStudio with V.I.A® (Vertical Intelligent Architecture):. To help remote teams collaborate more effectively, V.I.A. walls feature integrated multi-touch displays that help bridge the distance between team members. The intuitive display enhances the ability of local and distributed team members to co-create content in real time. Team members can swipe, expand simultaneously annotate and save content right on the display. Camera angles are intentionally positioned to optimize sightlines for remote colleagues making it easier to see digital and analogue content. Integrated media:scape technology by Steelcase makes it easy to share content from a variety of devices. This interactive display is shown in collaboration with Prysm.